Dead of Winter: The Long Night is the new stand-alone expansion for Dead of Winter: A Crossroads game. Obtain more of everything that made Dead of Winter an epic struggle for power and survival! Experience a new colony full of new survivors and new gameplay elements, each of which is introduced to players through its own game scenario. Fight off bandits from another colony! Build improvements to make the colony cozier! Unravel the mysteries of the new Raxxon Pharmaceutical location! It is full of powerful items, but also full of Raxxon’s twisted human experiments that show up in the game as disturbing new enemies. Play 2 special story scenarios that guide you through the new expansion modules. All new characters! All new crossroad card deck! All new main objectives! All new secret objectives! Tons of new items! Dead of Winter - The Long Night, can be bought alone and is a fully-realised Dead of Winter experience by itself. 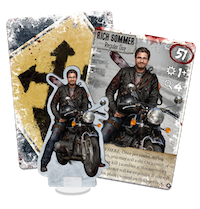 You can also combine everything - characters, items, objectives, crossroad cards, etc - between The Long Night and the original Dead of Winter.